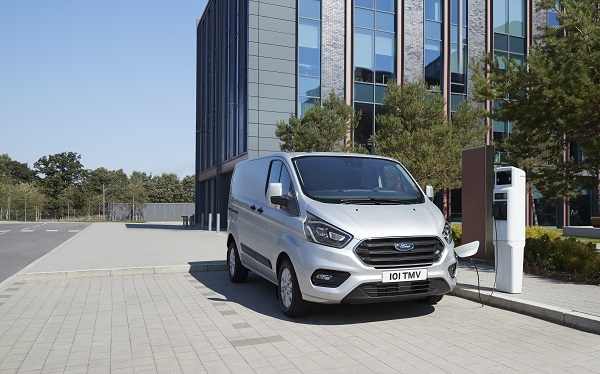 Ford has unveiled new fuel-saving electrified versions of its Transit van – a plug-in hybrid electric vehicle (PHEV) version of the mid-size Transit Custom and a ‘mild hybrid’ version of both the Custom and the full-size Transit with a 48V starter/generator system. Ford Australia is studying the case for the eco-friendly models to be launched in this market, and while a green light was still to be given at the time of writing, the fact that Ford’s recently appointed local chief, Kay Hart, was the global battery electric vehicle manager (distribution and digital experience) for the Blue Oval brand bodes well for their introduction here. The first series production PHEV in its class, the plug-in Transit Custom will enter production in the second half of 2019. It uses Ford’s 1.0L three-cylinder EcoBoost petrol engine but, rather than doing the main job of powering the vehicle, it serves as a ‘range extender’ which generates electricity that is then fed into a 14kWh lithium-ion battery pack located under the load floor. Full technical details were not provided at the vehicle’s unveiling in Germany, but the electric drive motor on board takes full responsibility for driving the front wheels and enables a 50km driving range on battery power alone – covering many inner-city trips – while the total driving range, with a full tank of petrol, is claimed to be more than 500km. Ford also says the Transit Custom PHEV retains the load volume and 1t payload capacity of the diesel-powered equivalent, while a full charge takes three hours using a 32A power supply or five hours via a domestic 10A socket. The driver will have three selectable EV modes to choose how and when to use the available battery charge: EV Auto (the default setting), EV Now (using only electric power until the battery is depleted) and EV Later (where the system aims to maintain current level of battery charge). Unique instrumentation and trip computer functions are provided, such as a power/charge gauge in lieu of the regular tacho and a smaller gauge for battery state of charge (replacing the engine coolant temperature indicator). Construction companies and utilities in Europe are among the commercial fleet operators that have been trialling the PHEV in recent months, with the vans equipped with telematics systems to gather data on operational and environmental performance, including charging and journey patterns and real-world electric-only range. Meanwhile, Ford also has first-in-class bragging rights with the so-called mHEV (mild hybrid electric vehicle) powertrain developed for Transit, which uses a belt-driven starter/generator instead of a conventional alternator in combination with the latest 2.0L EcoBlue diesel engine across all power ratings. The system is designed to capture energy when the vehicle brakes or decelerates, storing this as charge in the 48V air-cooled lithium-ion battery pack and using it to power the van’s electrical ancillaries and provide improved torque under acceleration and during normal driving. This reduces load on the diesel engine and, in combination with an updated automatic engine idle-stop feature, delivers fuel savings of up to 3% on average – or as much as 8% in start/stop urban conditions, based on the latest WLTP test procedure.